Everyone believes in something. Even those who claim to believe in nothing, or in nothing absolute, still believe in something (in this case, their relativism). Beliefs are important because they greatly impact how we live. For some Christians, however, more important than belief, or behavior, is belonging, a sense of community. Yet, community must be based on shared beliefs, shared goals, and common concerns. For Seventh-day Adventists—people from almost every conceivable manifestation of humanity—what holds us together as a community are our “fundamental beliefs,” all 28, which are foundational for growing in Christ and living as a community of faith in the light of eternity. Some argue that what matters is our love of Christ, not doctrine. This sounds nice, but the Bible never separates a love for Christ from a love for the truth. We are told that by “speaking the truth in love,” we may grow into Christ (Eph. 4:15-16). Knowing doctrine is not mere accumulation of correct data; rather, knowing doctrine results in love for God (2 John 1:6-11). Furthermore, the Bible is concerned about “sound doctrine” because, among other things, it affects the ethical life (1Timothy 1:9-10; Titus 2:1-5). The Seventh-day Adventist Church has a statement of 28 fundamental beliefs. These are not a creed, in the sense that one could not expect any further development of the truths expressed in them (or that even more teachings could be added). And though we must always be open to more light, a firm consensus on these beliefs is crucial to the unity and mission of the church. What has brought together millions of people from all over the world into a unified movement other than our shared doctrines? Within the great controversy motif, and directly related to it, salvation in Christ is the thread that runs through all our doctrines. The great controversy, and the issues it has generated, sets the stage for the plan of redemption, which underlies and permeates all 28 of our fundamental beliefs. Doctrines, then, are not an end in and of themselves. They are a means to an end, and that end is Jesus and knowing Jesus for ourselves and growing in Him. Or, more subjectively, all 28 of our doctrines should lead us to a deeper understanding of what Jesus has done for us through the plan of salvation, which, in turn, should lead us to a deeper love of God and a life more committed to the revealing of that love to the world and to “principalities and powers in heavenly places” (Eph 3:10). Yes, everyone believes in something. The goal of the quarter is to help us to not just believe in Truth (John 14:6), but to love Him even more and to grow in His grace. Kwabena Donkor, native of Ghana, is an associate director of the Biblical Research Institute at the General Conference headquarters, in Silver Spring, Maryland. 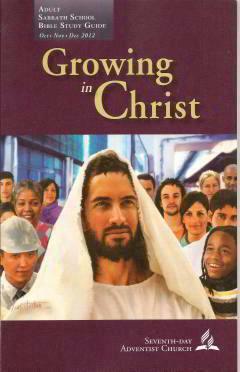 (This is the Introduction to this Quarter's lessons on Growing in Christ from our Index page. Read for This Week’s Study: Gen. 3:15, Rev. 12:1-17, Isa. 14:4-21, Ezek. 28:12-19, Isa. 53:6, Rom.1:20-28, John 16:2. Memory Text: “ ‘And I will put enmity between you and the woman, and between your seed and her Seed; He shall bruise your head, and you shall bruise His heel’ ” (Gen. 3:15, NKJV). Key Thought: The great controversy motif is the overarching concept that gives cohesion to Seventh-day Adventist fundamental beliefs. Necessity,” it has been said, “is the mother of invention.” The word mother, in this case, means “the source,” “the driving force,” “the foundation”; it’s the need, the necessity, for something that moves people to action. For instance, the need for cleaner air is the foundation, the driving force, behind the move for energy sources other than fossil fuels. Just as with physical inventions, a belief system also needs a foundation, a principle that explains it. Seventh-day Adventists profess a body of 28 fundamental beliefs. These beliefs have a foundation in a concept that we call the “great controversy.” Each of the 28 fundamentals deals with a particular aspect of this cosmic controversy. The beliefs that will be studied this quarter make the best sense against the backdrop of the great controversy motif. This week we will look at some of the key points of this foundation. *Study this week’s lesson to prepare for Sabbath, October 6. (New York, San Diego, London: Harcourt Brace & Company, 1952), p. 98. Study Genesis 3:15 and Revelation 12:1-17. Who are the key players in the controversy? While symbols are sometimes used to depict the players, why do we believe that the powers described here are real, literal beings? What would happen to our whole belief system were we to spiritualize away the reality of the great controversy between Christ and Satan and our role in it? It is not unusual for people to use terms such as the devil or angels, and even God, when they mean something very different from the meaning usually attached to those words. For example, there are some whose interest in the use of the word God focuses only on the function that the word performs in human language and society; they have no interest in whether “God,” in any form, exists. Whatever the symbols used to describe them, the Bible teaches that these figures are real entities engaged in a real conflict. That’s how we as Seventh-day Adventists understand them. Most of the doctrines studied this quarter will not make sense if the players identified in the controversy are not taken literally, which often puts us decidedly at odds with the prevailing culture. In fact, while secularism has taken many shapes and forms over the last two centuries, nothing characterizes secularism more than the push to eliminate all “other worldly” language from human discourse. With the success of science, people in some cultures are more and more inclined to think about issues scientifically. Angels and demons do not fare well in the scientific mode of thinking. Hence, contemporary culture is witnessing a gradual demise of belief in the supernatural. How strongly impacted is your own culture by the scientific, secular worldview? How much have you, personally, been impacted by it? Against what aspects of this worldview must we particularly guard? Although the Bible does not explicitly tell us the issues involved in the controversy between God and Satan, they can be inferred from some pertinent scriptural passages, such as Isaiah 14:4-21 and Ezekiel 28:12-19. In their original settings, these passages represented pagan kings of Tyre and Babylon; but, when read carefully, they provide details that go beyond these ancient near eastern rulers. Indeed, they point to the origin, position, and fall of Satan. In 1 Timothy 3:6. Paul warns against ordaining a new convert, cautioning that such an act might cause the person to become conceited and fall under the same judgment as the devil. How does Paul’s statement throw light on the two passages above, and in what way do these three passages together help us to understand some issues in the controversy? At least three issues are raised in the texts cited above: pride, autonomy, and independence. The Old Testament portrays a created, dependent being aspiring to be self-sufficient and independent. But independence is always independence from something or somebody. First John 3:8 says that the devil has sinned from the beginning; 1 John 3:4 defines “sin” as lawlessness. It follows, then, that Satan’s sin-which manifested itself as a quest for independence and autonomy-represented a desire to be freed from the “restraints” of God and His laws. Thus, by refusing to allow himself to be brought under the authority of God’s law, Satan showed that he wanted to live under a different set of conditions. This rebellion would also imply that the system of laws in heaven was not ideal, that something was, indeed, wrong with it. But because God’s law is a reflection of God’s character, a defect in the law would amount to a defect in God’s character. In short, Satan’s rebellion was as much against God Himself as it was against anything else. Pride, autonomy, independence. What do these words conjure up in your own mind? In what ways are any of us in danger of falling into the traps, sometimes very subtle, that pride, autonomy, and independence can set for us? After all, under the right conditions, what’s wrong with any of these concepts? “And I will put enmity between thee and the woman, and between thy seed and her seed; it shall bruise thy head, and thou shalt bruise his heel” (Gen. 3:15). In what way is the great controversy revealed in this text? The cryptic language of Genesis 3:15, in which the controversy is here predicted, gives us a hint of God’s rules of engagement in this conflict. We can see that the conflict, which had just begun on earth between the serpent and the woman, was going to take shape by involving the followers of the initial contestants: the “seed” of the woman and the “seed” of the serpent. In due course, as we know, the conflict would climax into a mortal clash between Satan and a male descendant of the woman, Jesus of Nazareth. God’s weapon of choice was Jesus-who would come to fight on behalf of the woman, suffer “bruises,” but ultimately deliver a deadly blow to the serpent. The weapon of choice was an act of sacrifice by Jesus, an act of selfless love. How do the following texts help us to understand some of the issues involved in the great controversy? How is the plan of salvation central to the whole thing? If you looked carefully at yesterday’s study, you would have seen a progression of how God manifested Himself and His truth in the midst of the great controversy. God worked through the patriarchal and Israelite sanctuary services, through Christ’s sacrificial atoning death, through the church, and through Christ’s own ministry in the heavenly sanctuary. Satan, however, has worked tirelessly to try to undermine the Lord’s plans. So much of the great controversy has been, and is now, fought out over these very issues. For instance, the sacrificial system practiced by the patriarchs, and in Israel’s sanctuary service, was designed by God to remind humankind of the Creator and to keep the hope of redemption alive. How did Satan seek to usurp and destroy the truth about the plan of salvation, especially as revealed in the sacrificial system? See Rom. 1:20-28; Deut. 32:17, 18. Of course, the incarnation of Christ, His ministry on earth, and His atoning sacrificial death on the cross were the central parts of how God chose to defeat Satan in the great controversy. The death of Christ would guarantee the undoing of Satan, who worked tirelessly against Christ. What do these texts ( Matt. 2:1-18, 4:1-11, 16:21-23, 27:39-42) tell us about the ways in which Satan worked against Jesus? After His death and resurrection, Christ established His church on earth to proclaim to lost humanity the good news of salvation. From the inception of the church, Satan has determined to weaken and destroy it. The following passages show some of Satan’s tactics against the church (See Acts 5:17-18; 7:54-60; 2 Thess. 2:1-4; 1 Tim. 4:1; 2 Pet. 2:1; Rev. 12:13-17). Meanwhile, the book of Hebrews tells of a real sanctuary in heaven where Christ entered after His ascension ( Heb. 4:14-16, Heb. 7:27). In Daniel 8:11-14, we can see Satan’s activity in connection with Christ’s priestly ministry in the heavenly sanctuary and his attempt to usurp that ministry. It’s one thing to read 1 Peter 5:8,9 and have an intellectual understanding of that warning; it’s another to actually live out that warning in our daily lives. How do we, in fact, resist the devil? How often during a single day are you aware of Satan’s efforts against you? “ ‘And if it seems evil to you to serve the Lord, choose for yourselves this day whom you will serve, whether the gods which your fathers served that were on the other side of the River, or the gods of the Amorites, in whose land you dwell. But as for me and my house, we will serve the Lord’ ” ( Josh. 24:15, NKJV). How does this text reveal what is, in many ways, the most foundational issue in the great controversy? Prophecy provides us with a view of the closing scenes of the conflict between God and Satan. For a period of 1260 years (Dan.7:25, 12:7, Rev. 11:2, ,12:14 13:5), Satan sporadically, but persistently, persecuted God’s people. In a final showdown written of in Revelation 12 and 13, Satan employs two earthly powers: a leopard-like beast ( Rev. 13:1-10) and a two-horned beast ( Rev. 13:11-17). And they employ all the tactics of Satan that were discussed in yesterday’s lesson. Revelation 14 is a description of the countermove to Satan’s maneuvers that God uses during the final stages in the struggle in order to bring the struggle to an end. What does Revelation 14:6-13 tell us about the ways in which some of the issues in the great controversy are going to be made manifest? From God’s perspective, a clear proclamation of the issues involved in the conflict (here represented as being sent by three angels) is necessary before the conflict comes to a close. Humanity needs to be intelligently informed in order for people to make up their minds about the issues. In the final conflict there will be people who stand loyal to God. In Revelation 14 they are symbolized by the number 144,000, possibly representative of an innumerable people from all the nations of the earth ( Revelation 7:4 ). But they remain obedient to the commandments of God in a time of great distress and are wholeheartedly devoted to the worship of their Creator God. They receive the approval of God and are victorious with Him while the impenitent are destroyed in the ensuing harvest ( Rev.14:14-2 ). The point is that one day this great controversy will be over. One thing about the great controversy: no one can be neutral. You’re either on one side or the other. Anyone can claim to be on the Lord’s side (see John 16:2); how do you know, for sure, that you really are? Bring your answer to class on Sabbath. Further Study: Read Frank B. Holbrook, “The Great Controversy,” pp. 969-1008 in Raoul Dederen (ed. ), Handbook of Seventh-day Adventist Theology. “The Bible is its own expositor. Scripture is to be compared with scripture. The student should learn to view the word as a whole, and to see the relation of its parts. He should gain a knowledge of its grand central theme, of God’s original purpose for the world, of the rise of the great controversy, and of the work of redemption. He should understand the nature of the two principles that are contending for supremacy, and should learn to trace their working through the records of history and prophecy, to the great consummation. He should see how this controversy enters into every phase of human experience; how in every act of life he himself reveals the one or the other of the two antagonistic motives; and how, whether he will or not, he is even now deciding upon which side of the controversy he will be found.”-Ellen G. White, Education, p. 190. In the quotation from the book Education given above, Ellen G. White writes that the great controversy enters into every phase of human experience. How true has this been in your own experience? Has your understanding of the great controversy motif been a source of strength or frustration as you cope with the issues of daily living in the world of sin and suffering? How confident can we be about the final resolution of the conflict between good and evil? What gives you assurance that evil will be overcome in the end? What reasons do we have for believing that? How, for instance, does the prophecy of Daniel 2 help to give us assurance about the ultimate outcome? In class, go over your answers to the final question on Thursday. The answer is especially relevant because of our understanding of just who the persecutors are going to be in the last days. How, then, can we be sure we will be on the right side? Gustave read the notice of evangelistic meetings in his town in Burundi. He had heard about Adventists-heard that they are sinners because they work in their gardens on Sunday. But Gustave decided to attend the meetings anyway. He hoped to learn something new about God. The messages touched his heart. Gustave couldn't attend the meetings on weekdays because of school, but he went on weekends. By the end of the second week Gustave had many questions. He asked the church elder to study the Bible with him. Before long Gustave was convinced that Adventists weren't sinning when they worked on Sunday; they were keeping the Bible Sabbath. He asked to join the Adventist Church. Gustave stopped attending classes on Saturday and went to church instead. One of his teachers warned him that if he continued to miss classes, he would be expelled. When Gustave's parents learned about it, they were upset. "Please allow me to worship God as He leads me," Gustave pleaded. Gustave tried to explain his faith to the school principal, too, hoping that he would excuse Gustave from classes. But the principal accused him of being a bad influence on other students. Unsure what else to do, Gustave returned to school on Sabbaths. But he spent his time reading the Bible instead of studying. The next year Gustave enrolled in a Christian high school, the only Adventist in the school. Although the school didn't hold classes on Saturday, they did hold mandatory religious classes that day. Gustave quickly became the leader of his chosen group. He shared his faith with the young people in the study group, and several wanted to know more about what he believed. He studied the Bible with them, but one by one they dropped out when their parents warned them about Adventists. After Gustave completed high school, his parents urged him to get a job. Most jobs required Sabbath work, and Gustave refused. His parents refused to support him if he wouldn't work. After many months he found work with ADRA. Gustave shares his faith with others and explains that Adventists aren't sinners because they work on Sunday; they're sinners saved by God's grace who seek to follow Jesus' example of obedience. Your mission offerings help support evangelism in Burundi and around the world. Thank you for giving so that others can learn God's will for their lives. 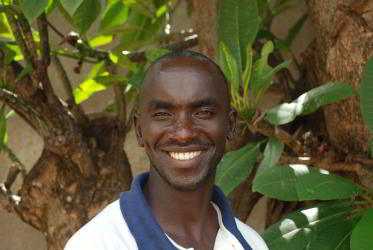 Gustave Ndayambaje lives in southern Burundi, a small country in central Africa.